You know it’s a bad day in the NBA when you packed for Phoenix and are going to Minnesota. You know it’s a bad day when you get a technical foul during the pregame instructions. You know it’s a bad day when you rip off your sweat pants to go into the game and everyone is staring and pointing. And you know it’s a bad day in the NBA when the other team’s bench outplays your starters. Like Tuesday in the United Center when the Bulls reserves basically took over the game against a lame Toronto Raptors team, which pretty much looked like owl bait much of the game, and defeated the Raptors 111-91. “Top to bottom, everybody played great,” said Carlos Boozer with a quiet 12 points and 13 rebounds in less than 25 minutes as the starters other than Luol Deng sat out the fourth quarter. “Everybody contributed. After the first quarter, we started playing great defense and got a big lead (59-41 at half). 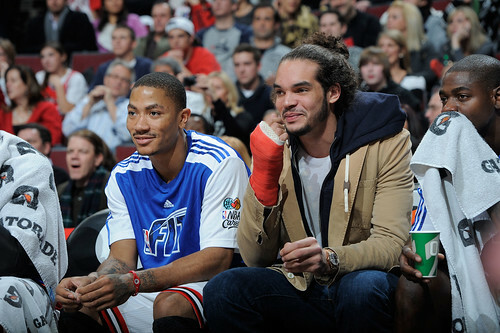 “Then the bench played great,” said Boozer. “Those guys can play. 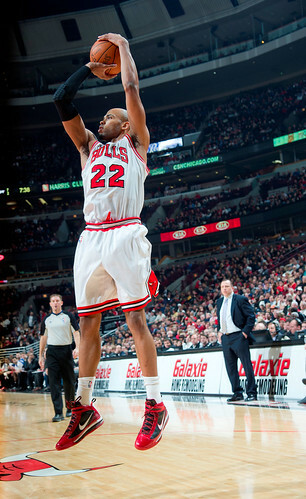 Taj (Gibson, with 16 points and 14 rebounds). You see how talented he is. 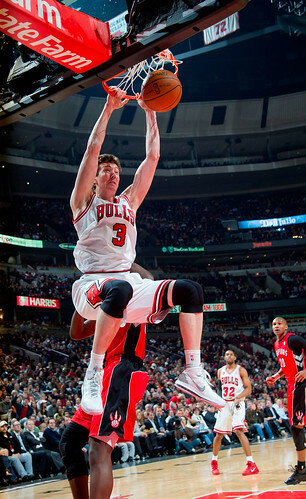 How talented the Big O (Omer Asik, with career highs of 13 points and five blocks). They were monsters. Both had monster games and played great. 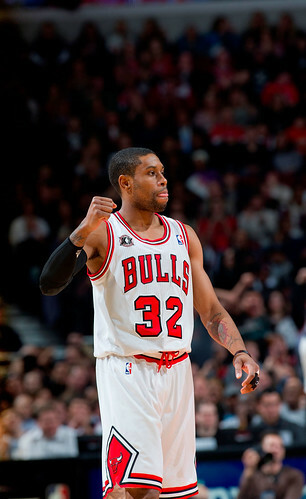 Taj had a double double in the first half. O came in the second half and was dunking everything. Everything he touched it seems like he was dunking the ball. It was great to watch, fun to watch. The reserves (nickname anyone? 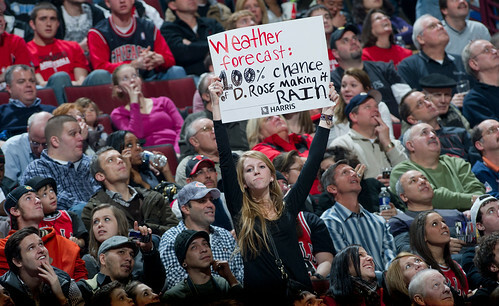 Did Boozer really call him the Big O?) combined for a season high 52 points as the Bulls won for the 14th time in their last 16 games and their fifth straight to improve to 23-10. Yes, the schedule has been kind with 13 of the last 16 games against teams with losing records, and the Bulls are 15-2 on the season against teams with losing records. But it’s not like those teams lose all the time. As miserable as this Toronto team seems, they are 11-23 and they’ve beaten the Magic, Celtics, Thunder, Rockets and Mavericks. 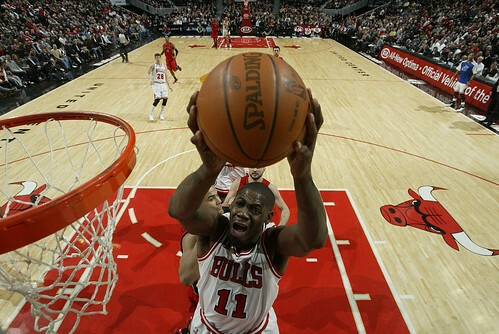 I don’t know how, either, though they can get hot and make some jumpers, which they did in the third quarter in going small and catching the Bulls off guard (and forward, too), cutting a 24-point Bulls lead to 10 early in the fourth quarter. But Gibson’s offense and Asik’s defense—even with a hard foul by Andrea Bargnani against Asik the Raptors were becoming so frustrated—held off Toronto after that, and an active Bulls defense pretty much closed it out and you could say the Raptors bought the Pepperidge Farm. And it was apparent the differences between the two teams. The talent level isn’t that much different, especially with most of the Toronto starters playing in the fourth quarter. But the Raptors don’t particularly compete. It was 104-80 Bulls with 4:11 left when Ronnie Brewer failed to get up enough and with his hand up on a Leandro Barbosa three. 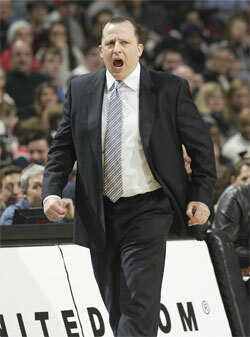 Bulls coach Tom Thibodeau, still very much standing, didn’t exactly fly into a rage. But let’s say his emotions were about to burst like water surging over a damn (I spelled it the way I meant to). 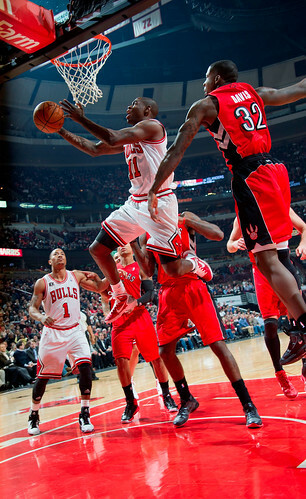 The Raptors failed to score in their next four possessions with the Bulls defenders skittering around like squirrels. People generally will take the path of least resistance. Sure, most have pride, but if you allow people to take the short cut and don’t make demands, they often will do just enough. It’s become clear that is one of Thibodeau’s strengths. It doesn’t matter the circumstance or situation. You play to the best level you can all the time. The Bulls have responded, which is why they are among the leaders in virtually every key defensive category even without anything close to an all-league defender at any position, especially with Joakim Noah out. 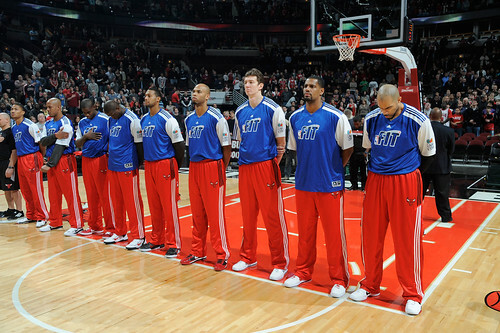 You can see on the other side of the floor, not as much is demanded, so the players don’t do as much. Hello, you are allowed to rotate in help. Yes, until you get it right. 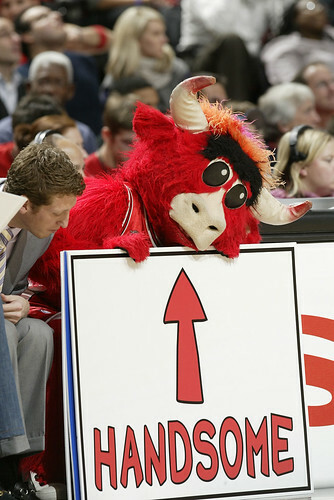 No one knows quite how long that lasts, but it’s working well for the Bulls now. It also helps Gibson returned to the form he showed last about six weeks ago before an ankle injury cost him a game on the Western Conference road trip and as he was just getting over that suffered a fairly severe concussion against the Clippers Dec. 18. Gibson was finally hitting that baseline 18 footer that looked so good and last seen in November, and was attacking the boards and did a terrific job covering up for Thibodeau’s initial mistake on Bargnani. Bargnani is a rare bird, a seven foot shooter in the Dirk Nowitzki mold, though not as polished in the post and without the mid range game. 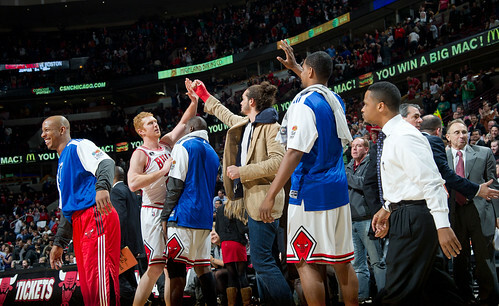 He’d just returned from injury, and Thibodeau went with his usual starting lineup, which put Kurt Thomas on Bargnani. Thomas, of course, couldn’t come out on Bargnani, a deft three point shooter, and when he tried Bargnani blew by him for 10 first quarter points as the Raptors got off to a 16-10 lead before Thomas went out. 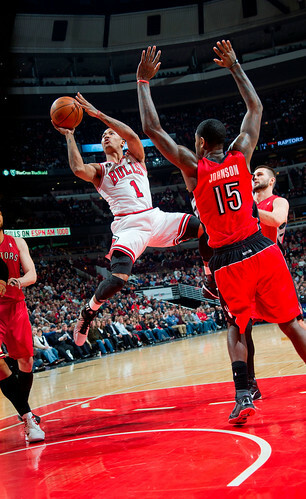 Thibodeau went back with Boozer, which was little better, though Rose began to take over and provided one of those wonderful highlights against the usual trap when he split the double on top and then went by the next pair at the basket for a layup to give the Bulls a 27-25 lead. Deng also continued his hot streak with a team high 24 points, now averaging 22.5 in the last four games with all at least 19 points. Still, the Bulls led just 29-27 going into the second quarter when Thibodeau went to the bench and finally put Gibson on Bargnani. 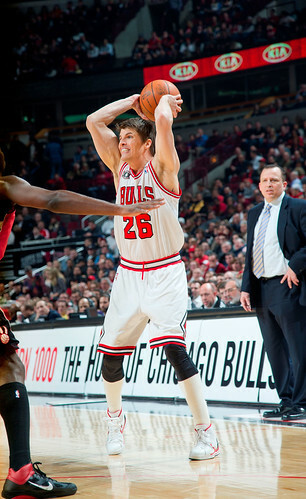 The bright spot in all this as well as Gibson’s return from the land of the fuzzy was Asik. Early in the second, he got Barbosa on him on a switch, called for the ball and power dunked. He then blocked Barbosa going the other way. Later in the game, he would have a driving move and thunder slam past rookie Ed Davis that would be called an offensive foul, seemingly unwisely. And while Asik made five of six shots, all dunks, and hit three of four free throws, what is most impressive about him is his instincts and coverages on defense. 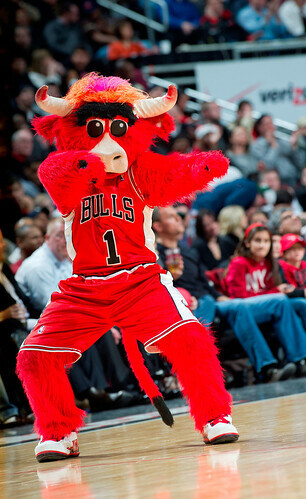 No, he’s not as athletic as Noah, nor can he get shots like Boozer or Gibson. But he probably is a better team defender than any of them. Asik’s help defense is superior and as a seven footer who stands tall, he had the Raptors trying to throw shots over him or pulling the ball out. He seems to understand the defensive schemes, which makes it surprising Thibodeau doesn’t play him more, though Thibodeau is the kind who doesn’t like to change up during a winning streak, though we hope he’s changing his underwear. I assume so as I noticed he got a haircut the other day, and it takes some noticing to notice that. I can talk about that as he still has me beat in number of follicles. 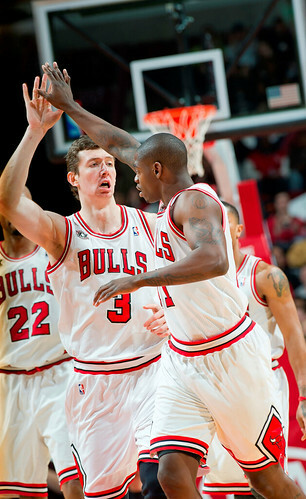 Thibodeau is right about that in that Asik doesn’t go up right away with the ball at times. 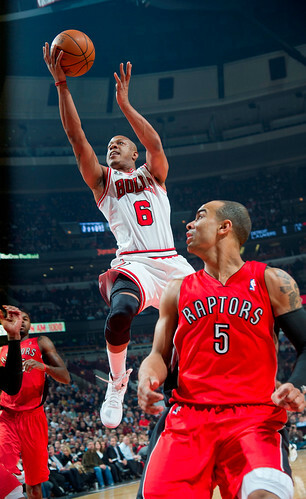 But he has been a surprise and I’d say now he probably could start for a dozen NBA teams, including the Raptors. I’d say also the 76ers, Pistons, Heat, Bobcats, Wizards, Spurs, Rockets, Thunder, Jazz, Suns and Clippers. He’s hardly a finished product, but you can put him in the game and get results, which is a big edge coming off the bench. The Bulls haven’t always had good production off the bench this season, though Thibodeau does have a quick hook for the reserves at times. 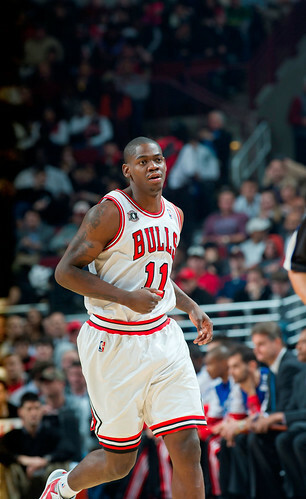 But Ronnie Brewer with a dozen quietly is averaging 10 points in the last three games and C.J. Watson ran the team with confidence and had five assists in 18 minutes and a terrific crossover move and layup in the fourth when the Bulls were blowing it open. And the Bulls finally broke out from their half court lethargy with 20 fast break points, more than double the daily rate of the last few weeks. 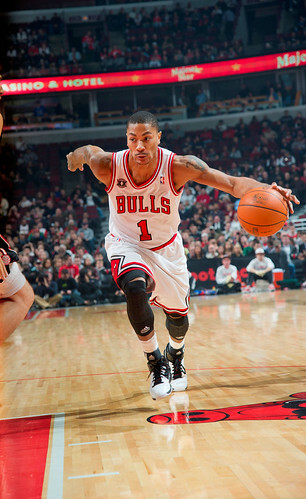 Rose, who finished with 19 points and six assists and a pair of threes, did pretty much take over the latter part of the second quarter when the Bulls pushed the lead into double digits and never saw it below that the rest of the game with another one of those great cradle-the-ball and attack drives, drawing three defenders and a pass to Kyle Korver for a three and a couple of passes to Boozer for open jumpers. “It’s tough to stay in front of him,” said Amir Johnson. And tough, of late, to slow down the Bulls.